The primary source of web content state is the web itself. Subject to certain limitations, if iudex-worker BARC output or visit database state is lost due to hardware failure, it may be recovered by bringing a new worker online from a previous backup and allowing it to catch up to the current state of the web. The most significant limitation to recovering state is the length of time that feeds retain references to content. Since some, generally higher volume new feeds, keep articles referenced for only a few days, daily backups and intervention times on the order of one day should be sufficient. TODO: Open BARC files would presumably be lost on iudex-worker failure since they would not yet be written to redundant storage. A utility should be written to validate BARC state against the visit database and mark lost writes accordingly (i.e. schedule new visit.) The alternative would be to support streaming/synchronous BARC writes to redundant storage. But this would likely be costly. Partitioning the visit queue on URL-extracted hosts (i.e. hash of host name modulo number of partitions) allows some content uniqueness and host politeness concerns to be localized to a single iudex-worker instance. The following distribution models have implications for both scalability and fault tolerance. TODO: this is the only model currently supported. 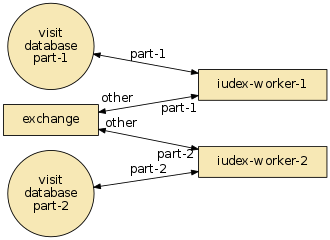 When polling work, each iudex-worker selects only visit URLs with hosts matching its unique hash offset. However, all discovered URLs (references from feeds, etc.) are updated in the central database. Thus the visit database itself provides the mechanism for a feed processed by iudex-worker-1 to reference content that will be hashed to, and eventually polled and processed by iudex-worker-2. Note that combinations of the multiple workers and partitioned (share-nothing) models are also possible.